India has always had a spot on our bucket list, mostly because of the famous Taj Mahal – and rightfully so, because it is absolutely stunning. But after our visit to India this year, we discovered that amidst its congested roads and insane crowds lies an amazing country filled with rich culture, majestic architecture and amazing cuisine. Our journey encompassed every tourist’s classic introduction to India – the Golden Triangle, comprising of Delhi, Agra, and Jaipur. Well connected to each other by good roads and railway, you will find that getting around is easier than you think. Here’s our travel guide bringing you the best of the Golden Triangle, and everything you need to know – where to stay, what to do and when to go, starting with Delhi. Disclaimer: Some of the links below are affiliate links. They come at no extra cost to you, but if you purchase through our site, we get a small commission or bonus which keeps our site running and allow us to continue creating free content for you. That being said, we only recommend vendors that we trust to use for ourselves. Thank you for your support! For more info on our disclosure policy, click here. It was our first visit to India, and as usual, there were first-time jitters but we felt right at home at The Imperial New Delhi. This luxury hotel lives up to its name as ‘The Best Heritage Hotel’ and offers a tranquil respite from the buzz of the city outside. The moment we stepped in its grandeur and glory, it felt like we traveled back in the era of 1934, the time it was erected. Every room in the hotel welcomes guests with a charming colonial layout and luxurious amenities. Vintage yet posh at the same time, the furnishings offered us comfort from a long day of sightseeing. The bed, topped with a Posturepedic mattress and with linen exclusive from France, made it easy to get a restful slumber. It’s no wonder they are ranked as one of India’s Top Hotels in Condé Nast Traveler Readers’ Choice Awards 2018. When it comes to dining options, there are plenty of choices! If you are looking to sample local Indian flavors, head on to Daniell’s Tavern. The Spice Route serves Southeast Asian cuisine while Nostalgia and San Gimignano go west, serving French and Italian fare respectively. If you find yourself indecisive on which cuisine to pick, the 1911 Restaurant presents a wide selection of international cuisines to try all at once; it’s your call! The Imperial Spa is a must-visit. We highly recommend getting a couples massage here, for their couple’s suite is one of the most luxurious suites we have experienced. Decked fully in white marble, the entire space exudes regal charm. The suite is spacious and comes complete with its own private jacuzzi, steam room, massage beds, and relaxation areas. The spa uses its own brand of products that are 100% organic, and their therapists are highly trained to give personal consultations on the various therapy treatments they offer. Before and after the massage, our therapists served us juices and tea, while giving us plenty of time to enjoy the suite facilities, making it impossible to not feel relaxed and pampered. The Imperial New Delhi brings its classic old world charm into the 21st century while keeping the atmosphere and service consistently top-notch and up-to-date. It was a worthwhile experience and in our opinion, deserves to be in every couple’s honeymoon checklist. You are not in India if you have yet to experience their local markets. Chandni Chowk, located in the centre of New Delhi was created by Shah Jahan all the way back in 1650A.D., and today still remains one of the most vibrant parts of the city. You will find stalls lined up narrow alleyways peddling goods of all sorts – from spices to scent, clothes to electronics. It was initially a little overwhelming for me, but it is a pretty exhilarating experience. Just as frenzied as Chandni Chowk and located west of it is the Spice Market, both in Old Delhi. This is the most prominent spice market in Asia. The sheer number of spices to choose from, coupled with their intense aromas, can be pretty overwhelming but also pleasant to look at with all their different colors. You can also buy nuts and dried fruit here. For an orderly alternative, try Dili Haat, a handicraft village. An admission fee of INR100 will lead you past the gates into a more calm atmosphere. Vendors here are friendly and the atmosphere is less hectic, though prices will be slightly higher. After Chandni Chowk, you can head to Jama Masjid and the Red Fort, both located close by. Jama Masjid is the largest mosque in India and can hold up to 25,000 people. This massive structure is an architectural masterpiece and a sight to behold. Made out of red sandstone and marble, it was built in 1656 by Mughal Emperor Shah Jahan, who also built the Taj Mahal. Admission is free, but there is a guy at the entrance collecting a camera fee of INR 300. 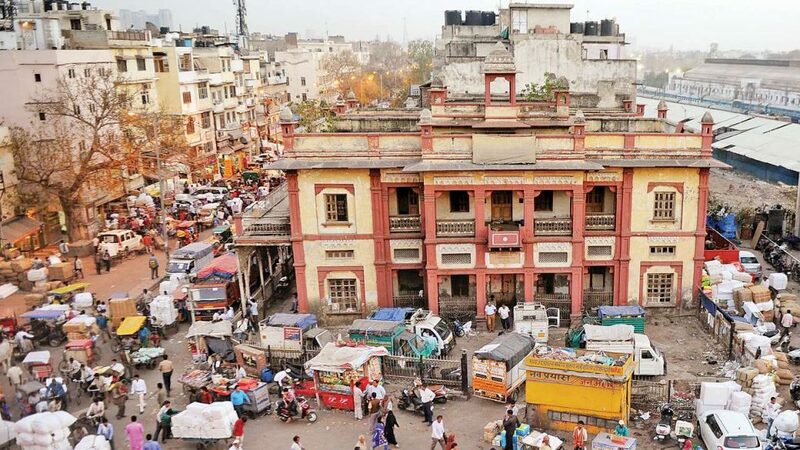 Getting There: You can walk from the Old Delhi Railway station, or if you are coming from the modern Metro, the closest one is Chawri Bazaar Stn., which is 500 meters away. You can catch a glimpse of the red fort while wandering the courtyard of Jama Masjid. But a short ride away will bring you right to the centre of Old Delhi, where these towering red sandstone walls that extend over 2km are hard to miss. Built on the banks of the Yamuna, the red fort was also known as Lal Qila and was home to the Mughal emperors for over two centuries. A mere 15 minutes from the airport will transport you to a realm of the contemporary living and delicious dining. Breaking the stereotype of near-airport hotels, Andaz Delhi – a luxury lifestyle hotel by Hyatt, is modern, spacious and thoughtfully designed with locally inspired details. As a tribute to the wonderful life in the city, the luxurious hotel curated ‘401 Reasons to Fall in Love with Delhi’ through scattering each piece of inspiration and passion across every suite among all the 401 guestrooms. In each room, you will find a distinct art piece that illustrates all of these reasons. 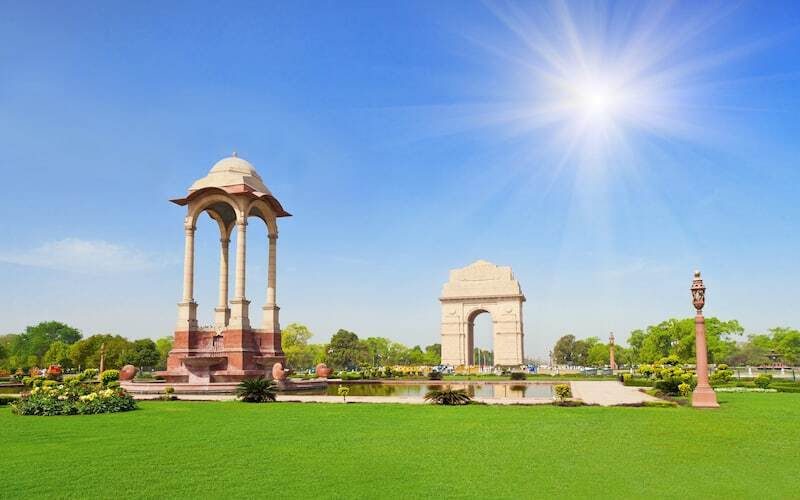 All discoveries are unfolded through different categories within Delhi’s building heritage, food, creativity, festivities, celebrations, culture, sports, shops, architecture, devotion, the buzz of the city and the tranquillity of nature as well as other things you can do around Delhi. Each morning, awake from your slumber in plush bedding, with pillows handpicked from a menu, rays of sunshine streak in through the wide windows as you lounge on the daybed admiring a courtyard or runway view. AnnaMaya serves up a delectable spread for breakfast and an all-day dining menu that is designed around consciously-sourced ingredients from local artisans. This modern European Food Hall inspired by the colours and flavours of India serves up some of the most delicious Indian food we tasted in our 3 weeks in India. Their dessert bar is also equally enticing, and they make exquisite artisanal products not to be missed. The Hong Kong Club is a bar, club, restaurant, and lounge all-in-one, that is definitely my choice to unwind when dusk falls. Featuring dramatic modern Chinese interiors, it adds a sense of flavour to its modern contemporary setting. Our visit to The Hong Kong Club had us enjoying handcrafted cocktails inspired by our Zodiac signs, and tucking into dim sum and snacks inspired by Hong Kong-Cantonese flavours. Another stop to make is Juniper Bar, an open-concept gin bar that makes a perfect place to socialise while experiencing a diverse selection of 35 stylised gin and tonic infusions. Enjoy a relaxed atmosphere where you can interact with the bartender and order any drink that meets your fancy. For the ultimate honeymoon, be sure to stop by the Andaz Spa and enjoy a soothing massage that aims to revitalise and re-energize your senses. Guided by your Chakra energy and desire, products for your journey will be handcrafted at the Apothecary blending bar. For honeymooners looking to have a relaxing time, Andaz Delhi – a luxury lifestyle hotel by Hyatt has it in store for you. They also have a 10,800 sq ft ballroom and an intimate alfresco area for a romantic wedding venue. On your next morning, head to Mehrauli, home to the Qutub Minar complex. Standing in stark contrast against the sky, with its peak 73 meters high, Qutub Minar is the tallest minaret in India. Erected almost a millennia ago, the entire structure is built using red sandstone, like many of the other architectural landmarks in India. Explore the complex and you will find some Mughal tombs and an iron pillar that is over 2,000 years old. Getting There: From Qutub Minar metro station (yellow line), it takes 20 minutes walk to get to the monument. At Lodhi Gardens, visit Humayun’s Tomb, built by Mughal emperor Humayun’s first wife nine years after he died. The mausoleum sits in the middle of a tranquil garden with small water channels running around it, a literal representation of rest in peace. There are several other tombs in Lodhi Gardens as well. Getting There: From the Jor Bagh Metro Station, exit to Gate 1 or 2. It takes 5-10 mintues walk from there. One of the most impressive monuments we saw in Delhi is Swaminarayan Akshardham. The compound, which resembles that of a theme park, is cordoned off quite strictly and you are required to hand over all camera and phone equipment before you enter. But the trouble is definitely worth it, for this grand temple complex is a Guinness World Record holder as the largest comprehensive Hindu Temple. Though constructed pretty recently in 2005, the main exhibit hall will leave you in awe, for the intricately carved marble walls and ceilings are fascinating. Another architectural marvel not to be missed is the Lotus Temple. The sacred lotus flower is a symbol of peace, and this temple is beautifully designed with 27 petals made of marble. It is a gorgeous sight and is slightly reminiscent of the Sydney Opera House too! Getting There: Take a five-minute walk from the Kalkaji Mandir metro station (violet line). On your journey from the airport to the city, you may want to stop by the India Gate for a quick photo. Constructed to honor the undivided Indian Army who sacrificed themselves in WWI, this war memorial serves as a significant landmark of the city’s past. Tourists and locals do like to hang around here during the evenings. Getting There: Get off at Barakhamba Road Metro Station on the blue line of the Delhi Metro. Then take a cab and reach the gate in roughly 15 minutes. The air is always buzzing with energy and sounds in New Delhi, which makes the quiet spots even more refreshing and alluring. Delhi takes traveling to a new dimension, and it is here you can indulge in a surprising mix of Indian culture and historical architecture. Never a dull moment, we recommend Delhi to be your first stop in India. The best time to visit India is from October to March. This period is winter, and it is mostly dry in Delhi (and Agra) from October to March and temperates are more moderate around 25-30°C. Early fog can be detected during the early mornings at the Taj Mahal from November to February, so take note if you want clear skies in your photos. May and June are the summer months and it can get very hot with highs at 40°C and lows at 26°C.